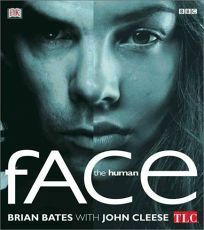 ""The face you see in the mirror had its beginnings in the primeval slime at the bottom of the sea,"" begins this large-format, picture-laden study The Human Face, by psychologist, biologist and sometime acting coach and director Brian Bates, with actor John Cleese. As early as ""nine minutes after being born... we prefer to gaze at faces,"" they report. Noting that the face is ""an identity tag,"" they explore ""how we became so dependent on our visual senses, and how that helped to shape the evolution of our features."" Moving from issues of beauty to ""a realm of hype and superhype: the phenomenon of fame,"" they question why certain faces are able to convince us, mesmerize us and sell us products. Based on a BBC series, this engaging, thoughtful and sometimes funny treatment will bring smiles to many faces.